I can’t see where there’s anything fantastic about it at all. I put quite a bit of study into the horn, that’s true…. I used to put in at least from 11 to 15 hours a day…over three or four years. Stay tuned for more frequent blog posts. Interviews have been and will probably continue to be sporadic, but I’m always thinking about practice, so will try to do some short practice advice blasts at least every few days. Today is about time. How much time to practice is one of those meta-questions. It doesn’t deal with actually how to practice, but how much time should be spent on practice. The glib answer is as much as you feel like doing. If you can’t get enough time in because you’ve got other time commitments, you can do some guerilla practice. Guerilla practice is quick bits of practice. This is one of the ways I practice when I’m working on a project that needs all my attention, and most of my time (like, for instance, a PhD dissertation to write). I’ll set a specific, very small goal, like say learning one chord change to another on guitar. Right now I’m learning Sweet Georgia Brown and polishing Limehouse Blues, both on guitar. When I can take a break, I’ll sit down for five to ten minutes and work on just one thing. It could be a run-through of Limehouse or working over a tricky change in SGB, like that last descending progression at the end of the tune. After the ten minutes are up (it’s very easy to go longer), I set the guitar down and continue with my project. Normally, I like to have a two-hour stretch of very focused practice in the late morning, but that’s not always possible, let alone the 11-15 hours a day that Parker mentioned. One of the blessings of being an adolescent is the available time to focus like that! Instead, I’ll do some guerilla practice. The progress takes a bit longer, but it’s progress! Also, several studies (I’ll post them in the book) show that several practice sessions throughout the day are better than one long session. 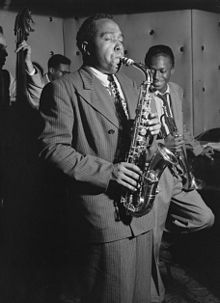 Here’s Charlie Parker, Paul Desmond, and one other guy talking about Parker’s music, practice and other things. Lots of gems in this clip.